Progress toward global budget transparency stalls for the first time in a decade. Many governments around the world are making less information available about how they raise and spend public money, according to the results of the Open Budget Survey 2017. After 10 years of steady progress by countries, the 2017 survey shows a modest decline in average global budget transparency scores, from 45 in 2015 to 43 in 2017 for the 102 countries that were surveyed in both rounds (scores are out of a possible 100). This is in stark contrast to the average increase of roughly two points documented among comparable countries in each round of the survey between 2008 and 2015. The reversal of transparency gains is particularly discouraging given roughly three-quarters of the countries assessed do not publish sufficient budget information (a score of 61 or higher), seriously undermining the ability of citizens worldwide to hold their government accountable for using public funds efficiently and effectively. Launched in 2006, the Open Budget Survey (OBS) is the world’s only independent, comparative assessment of the three pillars of public budget accountability: transparency, oversight and public participation. The sixth round of this biennial assessment, the 2017 survey evaluated 115 countries across six continents, adding 13 new countries to the survey since the last round in 2015. 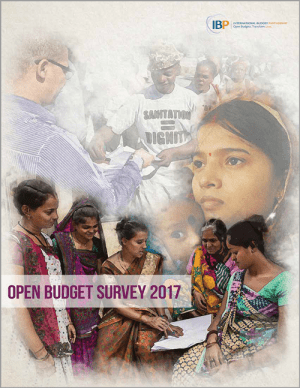 The Open Budget Survey assesses budget transparency based on the amount and timeliness of budget information governments are making publicly available. Each country is given a score between 0 and 100 that determines its ranking on the Open Budget Index. Declines in budget transparency were most dramatic in Sub-Saharan Africa, where the average budget transparency scores fell by 11 points between 2015 and 2017. Other regions experienced small increases or small declines in their scores, with the exception of Asia, where the average score rose more substantially. A number of countries have experienced significant gains in transparency since they were first included in the survey, including Georgia, Jordan, Mexico and Senegal. Although overall global transparency has declined from 2015, the level of transparency in 2017 remains well above where it was a decade ago. In addition, while the number of publicly available budget documents decreased in this round of the survey compared to 2015, those documents that are published contain slightly more information now than they did in previous years. Transparency scores in this round of the survey show that any government, irrespective of region or culture, can become more transparent. The vast majority of countries could quickly improve transparency by making documents they already produce publicly available. For more, see the Open Budget Index 2017 rankings here, or download the Open Budget Survey 2017 Global Report here. Not a single country out of the 115 surveyed offered participation opportunities that are considered adequate (a score of 61 or higher). The average global score is just 12 out of 100, with 111 countries having weak scores (lower than 41). Without opportunities for citizens’ active participation — particularly citizens from marginalized or vulnerable groups — budget systems may only serve the interests of powerful elites. For more on public participation, see the Open Budget Survey 2017 results by country here, or download the Open Budget Survey 2017 Global Report here. 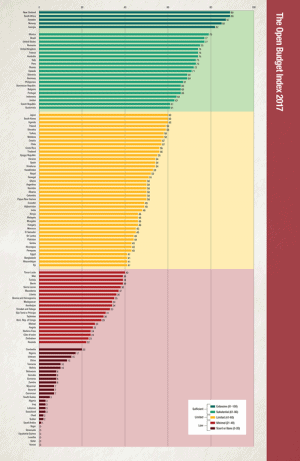 Only 32 countries’ legislatures (28 percent) have adequate oversight practices. While the basic conditions for supreme audit institutions to carry out their oversight function exist in the majority of countries surveyed, the conditions tend to be less favorable in countries that have lower levels of budget transparency. For more on budget oversight, see the Open Budget Survey 2017 results by country here, or download the Open Budget Survey 2017 Global Report here. The Open Budget Survey 2017 found that only 32 countries’ legislatures (28 percent) have adequate budget oversight practices.